Connectivity of cars and smartphones is having a significant impact on what we listen to behind the wheel. That is the result of a new study by Nissan. Motorists’ listening habits are shifting from broadcast radio and physical entertainment formats, such as CDs. Now they prefer downloaded or streamed audio via connected mobile devices. 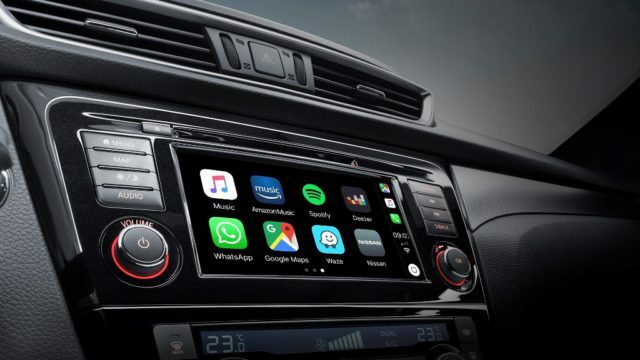 Compared to five years ago, before the launch of mainstream smartphone-mirroring systems like Apple CarPlay or Android Auto, the number of drivers that now mostly listen to on-demand entertainment via smartphones has more than doubled. Five years ago, this was the case for just one in 12 drivers (8.0%). Compact Discs have seen a steep decline in usage as a result. Just 11% of drivers still listen to ‘hard’ formats of audio, such as CDs. That is in comparison to more than a quarter (27%) five years ago. The buyer demand is serious. But less than half (46%) of respondents admitted they knew how to work all of their in-car entertainment technology. However, a third said they are glad they drive now compared to 30 years ago. Then in-car technology wasn’t so advanced. The study also found 60% of drivers think driving is ‘more fun’ if they are able to listen to music or other forms of entertainment. “In-car connectivity is one of the major transformational technologies of the automotive industry, and a pillar of the Nissan Intelligent Mobility vision for the future of motoring. The first AM-receiving in-car radio system debuted in 1932, followed by an FM version in 1952. Entertainment via the airwaves has also been accompanied over the decades by physical formats. Such are audio cassette and CD, but these are now fast-fading from daily usage. “Within the next decade, the integrated systems in our vehicles will be processing huge amounts of data. We’ll be streaming audio, navigational and visual information, entirely through cellular transmissions, with 4G and 5G connection speeds to manage this data demand. The latest version of the Nissan Qashqai, the UK’s best-selling crossover, is now available with an all-new infotainment system. It has functionality with significant modifications. Apple CarPlay and Android Auto are also available on the model. New NissanConnect further enhances the relationship between driver and vehicle. The benefit for customers is seamless and intuitive integration of their smartphone with the vehicle. Plus the ability to download ‘Over The Air’ (OTA) map and software updates. A 2017 survey by the mobile network Giffgaff found the average UK individual uses 1.75GB of mobile data each month. That is equivalent to 29 hours of podcasts or 11 hours of music. The study also predicted audio streaming would quadruple over the next five years. A 2018 Ofcom report also found the number of weekly podcast listeners in the UK has almost doubled in five years. They were 3.2m (7% of adults aged 15+) in 2013 and are 5.9m (11%) in 2018.